Great trip! 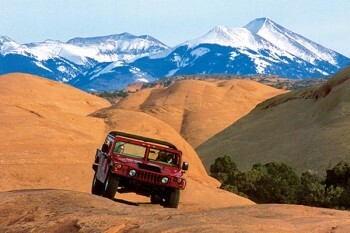 Fun excursions (Arches tour and Hummer drive) leading up to fun rafting trip. This trip was just right - exactly as billed. We had a great tour leader (Molly) for the Arches tour and the Hummer drive. She was informative and fun and had the best laugh - everyone had a smile on their face just listening to her. The Hummer drive was incredible. I was expecting a little jaunt around in a Hummer but it was like a slow roller coaster ride as Molly drove up, down, and around rock formations. Somewhat terrifying at times but thrilling for sure. The Moab Adventure Center had everything you might possibly have forgotten and Moab was a cool little town to explore. The rafting trip was fun - the water's were very calm and the water warm enough to float along in to beat the heat. I'm not much of a camper but the guides made everything fun and easy. Great trip for an introduction to rafting and camping.